SEO Strategies help you find the RIGHT clients and customers. Better still, what if your clients and customers could find YOU! Now that is even better!! Search Engine Optimization (SEO) plays a major role in matching you and your new potential clients! 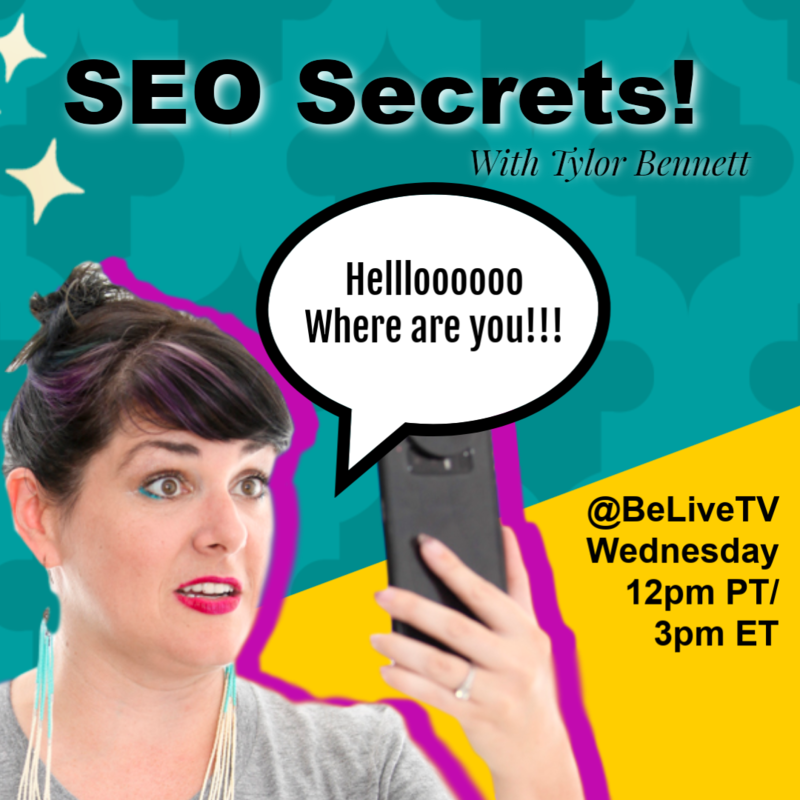 In this episode of Camera Confidence Live – I bring on a seriously awesome guest, Tylor Bennett, who shares SEO Strategies that work right now so that you can create content that is discoverable! And then… you know, people can throw credit cards at your face! Tylor and I connected via Pia Larson – Fingerprint Marketing. I've got to tell you he's the real deal! Tylor Bennett has been an internet marketer since 2012. He started his career doing mobile app marketing and generating downloads for Android app developers. Through paid advertising channels, he was able to generate thousands of downloads per day for several popular apps. In 2014 Tylor started focusing his work on organic search engine marketing and launched Seattle Web Works. Over the next year, Tylor was able to rank seattlewebworks.com for the search term “Seattle SEO” and other terms in the number 1 position. He’s held those rankings to this day. Since that time, Tylor has ranked over 50 of his own websites in Google on the first page in numerous industries. He’s also helped dozens of other business owners achieve long lasting first page rankings. In order for SEO strategies to work Google needs to rank your content. To rank your content it needs to be in a format, or on a page, that Google can index. Not all pages are indexable. Make sense. For example when you make a post on Facebook… Google can’t index that individual post so it is not ranked (However, the exception is Notes on Business pages! Have a look for those in your page template and add the “Notes” Tab in the left-hand column if you don’t have them already. They are FB’s equivalent to a blog post. And the good news is, they rank for SEO!!). Want to check on Google? Want to check and see if one of your pages is ranking? Here is a quick and easy way to check! Use the following format to type into your Google search field the page you want to check. For example, I am interested in how Google ranks my website. Then add the page you want to check after that special word (and don’t forget the colon ;). The way the internet is built is all around text-based content. Google does the best it can to index all that content so it can be searched, and searched quickly. The purpose of “searching” is to find what you are looking for and that is Google’s job… to present results to you. Want some stats? 25% of searches on Google are first-time searches! Wait! What! This is significant and a big reason to care. So, as people are looking for you… your pages need to be indexed so they can find you and the products and services you sell. You can use these SEO strategies to help Google to do this faster and more accurately. People are not only looking for your services. They are basically just looking to have their problems solved. So having content “around” what your products and services are is important. The first step is to have a page of content that can be indexed. As listed above some examples are, a FB Page (remember it is a FB page, not an individual post. Another is that special kind of content page on FB which is a “Notes” page on a Business profile), Yelp page, YouTube page, Website pages etc. The next step is to have a keyword. So let’s talk about that more in the next section below. Buyer intent: There has to be some buyer intent. This does not have to be exact, but there in the words. Search Volume: Meaning people need to be looking for this on a regular basis. Closely related: It needs to be closely related to your products and services. When you have these 3 elements in place your SEO strategies will begin to work well. In addition to these 3 elements are 2 types of keywords: core and fringe. When you are looking at your search terms there is always going to be some that are core to your products and services. These are what are referred to as “high buyer intent” terms and are “core” keywords. The other is “fringe” keywords or “in-fill” keyword. Fringe keywords are the ones “around” the products and services you offer. An example here for a plumber is “how to fix a leaky pipe”. Fringe or in-fill keywords are great for your blog content. These are the informational type of content that people are going to be searching for. To get SEO strategies working better be sure to put fringe content into your blog posts and on your website. Do the research. Put some thinking power into what your potential clients are searching for. Think about it and get creative. Then put content on your pages that Google can index. It can use that content and rank you in the results it serves up to people. This is no-joke time consuming and there is an art form to this. Begin to wrap your mind around all this stuff or if you are able to, hire it out to those with the expertise. Familiarize yourself with these SEO tools. Start to make use of these SEO strategies. I will detail the how-to on the first one, the Google search field. For the others, just hit up YouTube. There are hundreds of videos on how to use the tools listed below. I note which are free and which are paid tools. This is the most basic and yet effective form of keyword research all of you can do. Every time you do a search you have keyword research results staring you in the face! Start to look at those results strategically and use it!! For example, click into the Google search field and type the special word “how”, kind of like the special word above we used “site:” (remember the colon when using the word “site:”. For example, type “how facebook marketing” to research the topic of “facebook marketing”. Now you can replace the special word “how” with the other investigative words of, who, what, where, when, why… [topic phrase] in our case “facebook marketing”. There is no magic in this special word at the front this time… the Google search engine is just working to your advantage and doing it’s thing. You benefit from the results. Also to note is the results that drop down are not in any order of search volume. You will need a more sophisticated tool to uncover that data, however, these give you great insight into what people are searching on a given topic. Here is the thing with keywords: the most popular is not the best to go after on a given topic. This is because the most popular also have the most competition for it. You want the gaps around the topic that has less competition but high search volume. This is where the art form comes in. Finding these gaps. Also, it is important to note… you don’t have to battle with Google. Google wants to help you! It just wants content to index and then it can rank it in that index. This is a most basic mistake people make. SEO strategies work best when you create content that is very specific and valuable for people searching for that content. Okay here is the next mistake people often make. A services page is common to most sites. It is a single page that summarizes all the services that a company has. Pretty basic right!? Google treats each page like a document. Is your services page about the term “services”? No, it is not. It is about what half a dozen other things of what those services actually are. The solution: Make new separate pages for each of the services you offer. Keep your existing page if you like, then just link these other new services pages to it. The solution: write for your user… not the Google machine. If you write good content that users find valuable that is better. It is actually what the Google machine is being built and optimized to seek out and find. This leads to the next point which is engagement. The Best Google Metric is Engagement!! This is a super SEO strategy. Engagement is the best thing to focus on. Google uses this as the measure of valuable content. Think about it. Would content be valuable if when people got there they just left? No, they were not engaged. That content is not going to get ranked by Google (remember all content is indexed… but only “engaging content” gets served up in search results and gets ranked well). Write your content in such a way that keeps people there reading it. The parts you want to optimize are the Title of the article/post. This is the most important part as it tells the Google machine what to expect in the following content (as explained above for a poorly written Services page. The Google machine is just doing it’s thing. It sees it as a poorly written article because none of the content on the page is about the stated title which is the term “Services”). Here is the point: Google zeros in on the title like a laser and uses those words… then it expects the content on that page to match those words… if it doesn’t match… wah-wah-waaaaa you get a poor rank. If it DOES match you get a good rank. To help you out, here are some Techy Tips from Tylor. Cool stuff he recommends! This is a WordPress Plugin that makes this super simple. It helps you get your title in place for your content. There are fields you can fill in for your photos. It is great if you do fill these in with relevant info to your TITLE. But it is not harmful if you don’t so don’t worry about it if you have nothing there. If you do, great! If you don’t is it simply a missed opportunity. It is a photo editing software application. When you download a photo you can give it a title, you attach keywords to the photo. Stuffing word into regular copy in the content sometimes reads poorly grammatically, but in a photo title that is not read by a human and only the Google machine can be helpful to your page ranking. In the Yoast plugin go to Search Appearance then Media. Make sure your media files are redirected to the attachment page. This is just a yes or no setting and make sure it is set to yes. The reason you want to do this is that Google indexes all the parts. If you have this setting turned off (set to ‘no’) and you have 10 images in a blog post for example, Google will index 11 parts: the 10 images and the 1 blog post document. However, if you turn this setting to yes so the media files ARE redirected, Google will look at that post as only having one group together. This becomes important for what is called “crawl budget” that is explained in the next section: Taxonomies. Set your tags to ‘No index’. You don’t want your tag pages to be indexing. These are the archive pages of your site. You don’t want people to see these so don’t index them. This setting tells the Google machine to not index those pages, therefore not search or show then in results to people. Every site has a “crawl budget” and this is the percentage of the site Google will index. On big sites, this is important as you want to manage what Google indexes. Steer Google towards valuable content you want it to index. And also steer Google away from content you don’t want it to index. Crawl budget is not a factor for small sites (less than 100 pages). Write content to your audience… so it is valuable. Do even just the basic keyword research we talked about above… this addresses content they are searching for. Match the content you write… to the title… so important! Length of content is important… don’t be “thin” like short. 500 words is a minimum for a post or article. These days, longer like 2,000 words and more is great. Sure shorter is better for people’s attention span… but Google’s algorithm is NOT based on attention span. It is not how the Google machine works. Key Question: Do you want your post showing up when a search is done or your competitors? The long article will get served up. Google has gotten smarter. How long a person reads it, is what it is. I recommend this cool plugin called Simple Social Press. Takes Facebook Live broadcasts and turns them into blog posts on your site. The key thing it does is it puts the Facebook comments below the blog post. I asked Tylor what is the simplest thing we can do consistently to optimize organic search: SEO. He said one thing: DON’T OVER COMPLICATE IT!! Use the keywords in a good title and then write good content that matches it (make sure it is long). Track your progress with a Google ranking tracker. There are lots out there. They are useful and for basic sites. WordPress is much more flexible and capable. You can do anything you want on a WordPress site. The same can’t be said of the others. Index a Content Page: You need to have a page to even index. So create content on a page that can be indexed by Google to serve as a search result. Check it by the special word “site: [URL to check]”. Keywords: Do research and dial in the words and phrases that Google will use as it searches and will find your indexed content. Title: This is all important as you set the expectation for the Google machine. Content: Get the content onto your page. For example, a blog post on your website. THAT MATCHES YOUR TITLE!! Optimize your content. Yoast Plugin is great but there are other plugins. Just make sure you optimize your content. Write long content, like 2,000 words or more (500 is a minimum). Track your progress with a Google ranking tracker. There are dozens out there. Hook one up to your site and track your progress.